Have you lost your entire data from android devices and want to recover it? Using Android data recovery software, you can recover all deleted, lost or missing files from Android tablet PC and mobile phones mass storage devices. Data recovery software is fully capable to recover deleted data like digital photos, pictures, mp3/mp4 files, folders, songs, snaps and other precious data from different android devices. Android recovery program provides read only and non destructive solution to recover your lost data. Android recovery recover data in major data loss situations including formatted devices, virus/worm infection, logically crashed media and other data loss situations. Android data recovery program deeply scans android storage media and retrieve all lost data. You can recover all types of missing or deleted data using android data recovery software. Restores lost data from major manufactures of android devices: Android data restoration software supports data recovery from major manufactures of android devices, like Sony, HTC, Motorola, Samsung, LG and other android devices brands. Inbuilt disk scanning technique : Android data recovery software provides inbuilt disk scanning technique to recover lost data. Recover lost files of various extensions : Android file restore program helps you to recover deleted audio, video, image files and other types of files of different extensions. Supports long file name recovery : Android data retrieval software supports long size file name recovery and saves them at specific system location. 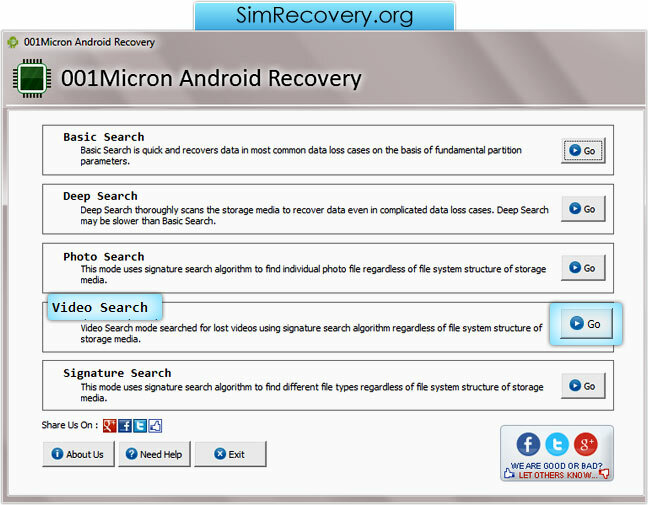 Simple to operate android file recovery software. Reliable and cost effective android data recovery program. Provides fast recovery of your lost android data. Safely retrieves your deleted data from various android devices without modify them.